The Blackburn Buccaneer was a British low-level strike aircraft with nuclear weapon delivery capability serving with the Royal Navy and the Royal Air Force between 1962 and 1994, including service in the 1991 Gulf War. Designed and initially produced by Blackburn Aircraft at Brough it was later known as the Hawker Siddeley Buccaneer when Blackburn became a part of the Hawker Siddeley group. In the early 1950s the Russian Navy introduced the Sverdlov class cruiser into service. Light cruisers by World War II standard, they were fast, effectively armed, and numerous. They presented a serious threat to the merchant fleets in the Atlantic, as the German "pocket battleships" of the war did, but in far greater numbers and over 25% faster. To counter this threat the Royal Navy decided not to use a new ship class of its own, but a new specialised strike aircraft employing conventional or nuclear weapons instead. Operating from its fleet carriers and attacking at high-speed and low-level, it would offer a solution to the Sverdlov problem. A detailed specification was issued in June 1952 as Naval Staff Requirement NA.39, calling for a two-seat aircraft with folding wings, capable of flying at Mach 0.85 at 200 ft (61 m) above sea-level, having a combat range of over 400 nmi (740 km; 460 mi), and carrying a nuclear weapon internally. Based on the requirement, the Ministry of Supply issued specification M.148T in August 1952, and the first responses were returned in February 1953. Blackburn's design by Barry P. Laight, Project B-103, won the tender in July 1955. 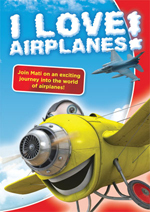 Owing to secrecy, the aircraft was called BNA (Blackburn Naval Aircraft) or BANA (Blackburn Advanced Naval Aircraft) in documents, leading to the obvious nickname of "Banana Jet". The first prototype made its maiden flight from RAE Bedford on 30 April 1958. 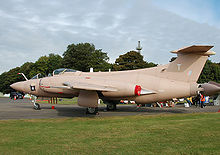 The first Buccaneer model, the Buccaneer S.1, was powered by a pair of de Havilland Gyron Junior turbojets producing 7,100 lbf (32 kN) of thrust. This mark was somewhat underpowered, and as a consequence could not take off fully laden with both fuel and armament. A temporary solution to this problem was the "buddy" system; aircraft took off with a full load of weaponry and minimal fuel and would sortie with a Supermarine Scimitar that would deliver the full load of fuel by aerial refueling. This was not an ideal solution, however, as the loss of an engine during take-off could have been catastrophic, and the Gyron Junior gave a poor range due to high fuel consumption. 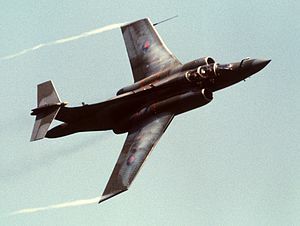 The long term solution was the Buccaneer S.2, fitted with the Rolls-Royce Spey turbofan, providing 40% more thrust with a greatly reduced fuel consumption. The engine nacelles had to be enlarged to accommodate the Spey, and the wing required minor aerodynamic modifications as a result. 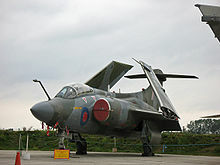 The Buccaneer S.2 had completely replaced the S.1 by November 1966. In January 1963, 16 aircraft were ordered by the South African Air Force, as the Buccaneer S.50. These were S.2 aircraft with the addition of Bristol Siddeley BS.605 rocket engines to provide additional thrust for the "hot and high" African airfields. The S.50 was also equipped with strengthened undercarriage and higher capacity wheel brakes, and had manually folded wings. In-flight refueling was also specified and due to the vast coastline, longer range 430 US gallons (1,600 l; 360 imp gal) underwing tanks. After the cancellation of both the BAC TSR-2 and F-111K tactical bombers, the Royal Air Force eventually adopted the Buccaneer in 1968. This was ironic as the RAF had, ten years earlier, rejected Blackburn's B-108 proposal for a Buccaneer variant; instead favouring the TSR-2 to meet its Operational Requirement GOR.339 for an English Electric Canberra replacement. A total of 46 new-build aircraft for the RAF were built by Blackburn's successor, Hawker Siddeley, designated S.2B. These had RAF-type communications and avionics equipment, Martel air-to-surface missile capability, and could be equipped with a bulged bomb-bay door containing an extra fuel tank. Some Fleet Air Arm Buccaneers were modified in-service to also carry the Martel anti-ship missile. Martel-capable FAA aircraft were later redesignated S.2D. The remaining aircraft became S.2C. RAF aircraft were given various upgrades. Self-defence was improved by the addition of the AN/ALQ-101 ECM pod (also found on RAF's SEPECAT Jaguar GR.3), chaff / flare dispensers and AIM-9 Sidewinder capability. RAF low-level strike Buccaneers could carry what was known as "retard defence"; four 1,000 lb (453.6 kg) retarded bombs internally that could be dropped to provide an effective deterrent against any following aircraft. They were able to operate the AN/AVQ-23E Pave Spike laser designator pod for Paveway II guided bombs and act as target designators for other aircraft. From 1986, No. 208 Squadron RAF replaced the Martel ASM with the Sea Eagle missile. The Buccaneer was a mid-wing, twin-engine monoplane with a crew of two seated in tandem under a sliding canopy. To meet the demands of the specification, the Buccaneer featured a number of advanced design features. The fuselage was area ruled; meaning it was designed to reduce drag at transonic speeds. This gives rise to the characteristic curvy "Coke bottle" shape. It featured a variable incidence tailplane that could be trimmed to suit the particular requirements of low-speed handling or high-speed flight. At the low-levels and high speeds traditional bomb bay doors could not be opened safely into the air stream, therefore doors were developed that rotated into the fuselage to expose the payload. This configuration was also useful in assisting ground-level access. The small wing of the Buccaneer was suited to high-speed flight at low level. Such a wing, however, did not generate the lift that was essential for carrier operations. Therefore the wing and horizontal stabiliser were "blown" by bleeding compressor gas from the engine through surface vents; this was known as "Boundary layer control" or BLC, and had the effect of energising and smoothing the boundary layer airflow, which significantly reduced airflow separation at the back of the wing (and therefore decreased stall speed) and increased effectiveness of trailing edge control surfaces including flaps and ailerons. Before landing, the pilot would open the BLC vents as well as lower the flaps to achieve slow, stable flight. A consequence of the blown wing was that the engines were required to run at high power for low-speed flight in order to generate sufficient compressor gas for blowing. Blackburn's solution to this situation was to provide a large air brake. The tail cone was formed from two leaves that could be hydraulically opened into the airstream to decelerate the aircraft. The nose cone and radar antenna could also be swung around by 180� to reduce the length of the aircraft in the carrier hangar. 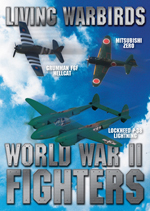 This feature was particularly important as contemporary British aircraft carriers were small. 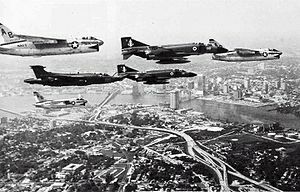 Picture - A flight of three U.S. Navy Vought A-7E Corsair IIs, two Royal Navy McDonnell Douglas Phantom FG.1 and a Royal Navy Blackburn Buccaneer S.2 over Jacksonville, Florida in 1976. The Phantoms were from No. 892 Naval Air Squadron, and the Buccaneer from No. 809 Naval Air Squadron, of HMS Ark Royal (R09)�s air group. The Buccaneer entered service with the Fleet Air Arm (FAA) in 1962. In addition to conventional ordnance, the Buccaneer was type-approved for nuclear weapons delivery in 1965. Weapons deployed included Red Beard and WE.177 drop-bombs, which were carried internally in a rotating bomb-bay. A total of six FAA squadrons were equipped with the Buccaneer: 700B/700Z (Intensive Flying Trials Unit), 736 (training), 800, 801, 803 and 809 Naval Air Squadrons. Buccaneers were embarked on HMS Victorious, Eagle, Ark Royal and Hermes. On 28 March 1967, Buccaneers from RNAS Lossiemouth bombed the shipwrecked supertanker Torrey Canyon off the western coast of Cornwall to make the oil blaze and to avoid an environmental disaster. The Buccaneers aboard HMS Ark Royal took part in a mission over British Honduras shortly before its independence to deter a possible Guatemalan invasion. They also took part in several exercises in the North Sea, "taking out" ground and naval targets, while always ready to respond to any Soviet interference. The Buccaneer was retired from Fleet Air Arm service with the decommissioning of the Ark Royal in 1978. The first RAF unit to receive the Buccaneer S.2B was 12 Squadron at RAF Honington in 1969. This was to remain a key station for the type as 15 Squadron equipped with the Buccaneer the following year, before moving to RAF Laarbruch in 1971. With the phased withdrawal of the Royal Navy's carrier fleet during the 1970s, Fleet Air Arm Buccaneers were transferred to the RAF, which had taken over the maritime strike role. 62 of the 84 S.2 aircraft were eventually transferred, redesignated S.2A. Some of these were later upgraded to S.2B standard. Ex-FAA aircraft equipped 16 Squadron, joining 15 Squadron at RAF Laarbruch, and 208 Squadron at Honington. The last FAA aircraft went to 216 Squadron. From 1970 with 12 Squadron initially, followed by 15 Squadron, 16 Squadron, No. 237 OCU, 208 Squadron and 216 Squadron, the RAF Buccaneer force re-equipped with WE.177 nuclear weapons. At peak strength Buccaneers equipped six RAF squadrons, although for one year only. A more sustained strength of five squadrons was made up of three squadrons (15 Squadron, 16 Squadron, 208 Squadron) plus No. 237 OCU (a war reserve or Shadow squadron) all assigned to Supreme Allied Commander Europe (SACEUR) for land strike duties in support of land forces opposing Warsaw Pact land forces on the Continent, plus one squadron (12 Squadron) assigned to SACLANT for maritime strike duties. Picture - A 12 Sqn Buccaneer S.2B in 1981. After 1983 the land strike duties were mostly re-assigned to the Tornado aircraft then entering service, and two Buccaneer squadrons remaining (12 Squadron, and 208 Squadron) were then assigned to SACLANT for maritime strike duties. Only the 'Shadow Squadron' No. 237 OCU remained assigned to a war role of land strike assigned to SACEUR until it stood down from its war reserve nuclear delivery role in 1991. After a Buccaneer suffered a structural failure in mid-air during a Red Flag exercise, the entire RAF Buccaneer fleet was grounded in February 1980. Investigation discovered serious metal fatigue problems. A total of 60 aircraft were selected to receive new spar rings and the nascent 216 Squadron was subsequently disbanded. Later the same year, the UK-based Buccaneer squadrons moved to RAF Lossiemouth. The Buccaneer saw war service during the 1991 Gulf War when twelve examples were rushed to the area to provide a laser designation capability for British aircraft. 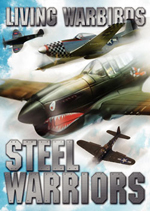 They flew 218 missions, both designating for other aircraft and dropping 48 laser-guided bombs themselves. The last Buccaneers were withdrawn in March 1994 when 208 Squadron disbanded. 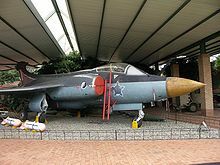 South Africa was the only country other than the UK to operate the Buccaneer, where it was in service with the South African Air Force from 1965 to 1991. Of the 16 aircraft ordered, one was lost on its delivery flight, and 15 entered service. SAAF Buccaneers saw active service during the Border War in South-West Africa, notably at Cassinga in 1978. Picture - A 700Z Sqn Buccaneer S.1 at RNAS Lossiemouth in 1961. Blackburn NA.39 Pre-production build of 20 aircraft. Buccaneer S.1 First production model, powered by de Havilland Gyron Junior turbojet engines. 40 built. Buccaneer S.2 Development of the S.1 with various improvements and powered by the more powerful Rolls-Royce Spey turbofan engines. From 1962 10 were built by Blackburn Aircraft Ltd. and 74 by Hawker Siddeley Aviation Ltd.
Buccaneer S.2A Ex-Royal Navy S.2 aircraft reworked for RAF. Buccaneer S.2B Variant of S.2 for RAF squadrons. Capable of carrying the Martel anti-radar or anti-shipping missile. 46 built between 1973 and 1977, plus three for Ministry of Defence weapons trials work. Buccaneer S.2C Royal Navy aircraft upgraded to S.2A standard. Buccaneer S.2D Royal Navy aircraft upgraded to S.2B standard, operational with Martels from 1975. Buccaneer S.50 Variant for South Africa. Wings could be folded but folding was no longer powered. Aircraft could be equipped with two single-stage rockets (see RATO) to assist take-off from hot-and-high airfields like that of AFB Waterkloof in Pretoria, where the type was mostly based. Three privately owned Buccaneers located at Thunder City in Cape Town are still airworthy in 2009. In the United Kingdom Buccaneer S2 XX885 is being rebuilt to flying condition by Hawker Hunter Aviation. It was granted UK CAA permission to fly in April 2006. A number of Buccaneers in the UK are in fast taxiing condition and several more are being rebuilt to taxiing condition. Gething, Michael J. "The Buccaneer Bows Out: Valediction for the Sky Pirate". Air International, March 1994, Vol. 46, No 3, pp. 137-144. Stamford, UK: Key Publishing. ISSN 0306-5634. Green, William. Aircraft Handbook. London: Macdonald & Co. (Publishers) Ltd., 1964. Green, William. The Observer's Book of Aircraft. London: Frederick Warne & Co. Ltd., 1968. Jackson, A.J. Blackburn Aircraft since 1909. London: Putnam, 1968. ISBN 0-370-00053-6. Winchester, Jim, ed. "Blackburn Buccaneer." Military Aircraft of the Cold War (The Aviation Factfile). London: Grange Books plc, 2006. 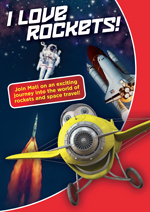 ISBN 1-84013-929-3. Blackburn Buccaneer Pictures and Blackburn Buccaneer for Sale.